Momentum has revealed the results of its Brexit consultation, which show that 41% of members surveyed support a ‘people’s vote’ in “all circumstances”. A further 28% would only want a Brexit vote if there was no possibility of a general election, meaning a total of 53% support another referendum now. Only 17% said they did not want another Brexit referendum at all. The full results of the consultation have been published here. The consultation was launched on 22nd October and closed on 1st November. Over those ten days, over 6,570 Momentum members answered the questions, which asked how they felt about Theresa May’s negotiations, the impact of Brexit and whether the Tory deal should be voted down in parliament. The digital survey was sparked by the efforts of Momentum member and pro-EU activist Alena Ivanova, who got the required number of signatures on a petition demanding that all Momentum members have a say on “whether to oppose Tory Brexit, and whether to campaign for Labour to hold a vote at annual conference in September on giving the people the final say on the Brexit deal”. Momentum’s national coordinating group (NCG) agreed at the beginning of September to hold the consultation, but only after Labour conference. This meant that the Corbynite group as a whole took no formal position on Brexit at conference. 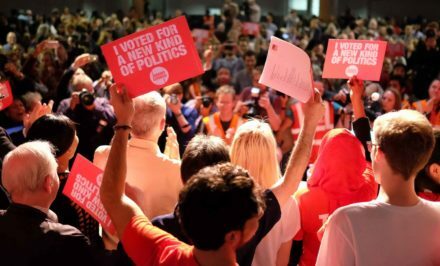 Commenting on the results, Momentum are most keen to emphasise that its members overwhelmingly backed the Labour leadership’s position on Brexit, both in terms of voting down May’s deal and opposing no-deal.